Background: Fatigue is reported by more than 75% of multiple sclerosis (MS) patients. 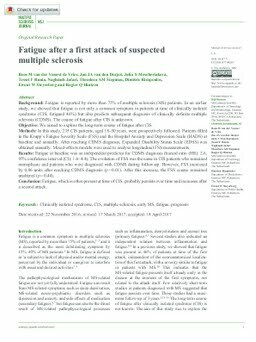 In an earlier study, we showed that fatigue is not only a common symptom in patients at time of clinically isolated syndrome (CIS; fatigued 46%) but also predicts subsequent diagnosis of clinically definite multiple sclerosis (CDMS). The course of fatigue after CIS is unknown. Objective: We aimed to explore the long-term course of fatigue after CIS. Methods: In this study, 235 CIS patients, aged 18–50 years, were prospectively followed. Patients filled in the Krupp’s Fatigue Severity Scale (FSS) and the Hospital Anxiety and Depression Scale (HADS) at baseline and annually. After reaching CDMS diagnosis, Expanded Disability Status Scale (EDSS) was obtained annually. Mixed-effects models were used to analyse longitudinal FSS measurements. Results: Fatigue at baseline was an independent predictor for CDMS diagnosis (hazard ratio (HR): 2.6, 95% confidence interval (CI): 1.6–4.4). The evolution of FSS was the same in CIS patients who remained monophasic and patients who were diagnosed with CDMS during follow-up. However, FSS increased by 0.86 units after reaching CDMS diagnosis (p = 0.01). After this increase, the FSS course remained unaltered (p = 0.44). Conclusion: Fatigue, which is often present at time of CIS, probably persists over time and increases after a second attack.